What is a Nurse Educator? Many individuals who are interested in pursuing a career in the field of nursing may wonder what exactly is a nurse educator. Nurse educators are important players in the field of nursing who work in an academic setting or a hospital setting to train the next generation of bedside nurses. As a teaching professional dedicated to solely the field of nursing, you will need to focus on becoming an expert in the field so that you can educate and also work alongside nurses who want to advance their profession. 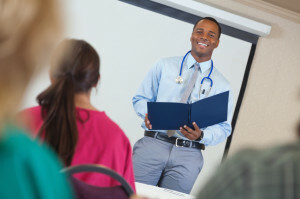 A nurse educator can work in a classroom at a college or university, within a research facility, or even in a practice setting. No matter what setting they work in, an educator plays an important role in preparing and mentoring nursing professionals who provide patient care or those who lead bedside nurses. They will work closely with nursing students and newly licensed professionals to watch the professionals gain confidence with patients and to watch them gain more technical skills. They will serve as role models in the setting where they work, help conduct research, share public policy and improve the patient outcomes by preparing nursing students to deal with all situations. What Is Your Schedule Like When you Become a Nurse Educator? There are many different career paths that nursing educators can take. You can work as a part-time clinical faculty member or as a full-time faculty member who teaches nursing professionals on a full-time basis. If you work as an adjunct educator in a clinical setting, you may also work in a clinical setting while you are outside of the classroom so that you can maintain your competence and share all of the knowledge that you gain in the setting with your nursing students. You may also be able to pursue other titles in the field, which include: administrative nursing professionals, professors, associate deans, continuing education and staff development. Is Nursing Education Right For You? Nursing educators spend a lot of time mentoring, teaching and counseling nursing professionals. To play such an important role in the field, you need to be sure that you are the right fit. The best nursing educators need to be innovative, independent professionals who have a vision. To flourish, you will need to be both intellectual and creative. You need to inspire nursing students to push through the touchy times while still giving them the knowledge that they need to be professionally competent. If you can do all of this, nursing education may be for you. The average salary for nursing educators in the public sector is $176,000 per year, according to the National Student Nurse Association. Salaries are also high in clinical settings when you have a doctorate degree. If these salaries sound enticing, it is time to consider what path you will need to take to prepare for the educator role. To begin the process, you will need a Master’s in Nursing and you will later need to consider doctoral degrees. Now that you know what a nurse educator is, you can make an informed choice about your career path.